So, I was challenged to watch an episode of "Love Island", a show on itv2, and blog about it, and never one to turn down a challenge (not quite true, I turn down stuff all that time), I went for it. 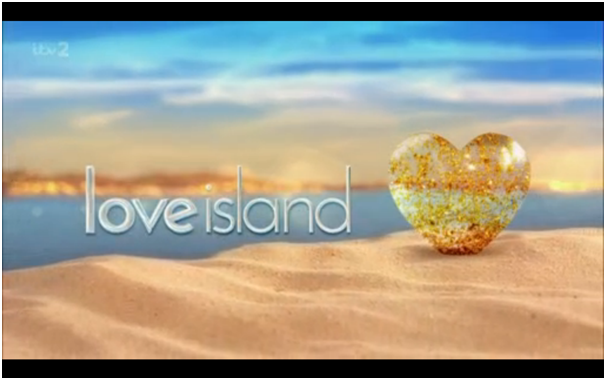 Now, I know virtually nothing about Love Island, except that it involves a group of males and females who are presumably on an island, and looking for love. I have to say right now that I apologise intensely to anyone reading this that is a fan of Love Island for anything derogatory in the post. So, apparently there's a villa? And a bunch of boys and girls, referred to as "the islanders". From the single episode I saw I have limited information on what goes on, but I'm led to believe that they get to go on dates, couple up, and share beds. The show reminds me a bit of Big Brother, although I've not watched that for years either, but the secluded location with limited people, dormitories, interview room, brings back the memories of Big Brother. Anyway, on with a summary of the events from tonights show. The show started by telling us that these two had a lot of fun last night. And with the question answered, they went about their day. Anyway, a lot of this post is about Adam. 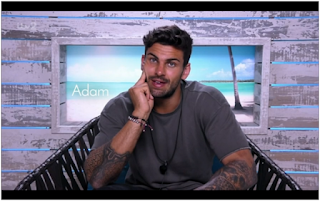 Adam is the alpha male of the group, and he's been spending time with a girl called Rosie, who is very nice but according to Adam likes shoes and bags instead of holidays. This rang alarm bells with Adam. Adam the alpha male. You can tell, he's pointing. Most of this post is about Adam, but just to give a flavour of the other stuff talked about, this is Charlie. "Do you tint your eyebrows?" the girl asked. "Just tint them" she urged. This confused Charlie. "Just tint them" she clarified in a non-clarifying way. Afterwards the girl commented to another girl that "I really like Charlie but he should really tint his eyebrows." Anyway, back to Adam. Apparently Adam was on the lookout for getting to know other people beyond Rosie, who seemed to be more into him than he was into her. Straight brows and Adam had a very nice chat where he talked about how Rosie was materialistic and went on to ask straight brows why they hadn't been on a date. 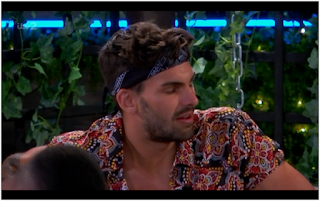 After the chat straight brows (aka Megan) told Rosie that Adam had been complaining about her. For a 'player', as Adam seems to be, he seems to be blissfully unaware that sometimes girls talk to each other. "He's got some big balls going on" commented one of the girls on hearing the news. No idea if that's an expression or an observation. Another girl reassured Rosie by saying "It's ok babe, it's made his cake ain't he, he ain't eating it." which I assume is some sort of reference to the Great British Bake Off, because otherwise, unless you're a professional baker who sells cakes, that's exactly what you do with cake. 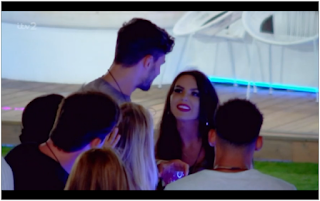 Fuelled by drink, Rosie went to confront Adam, telling the girls "I'm doing this for not me, but for every girl that's been played by a play boy"
Rosie confronts the alpha male. To be honest I can't really remember much about the confrontation, but it went much as you'd expect - Rosie told Adam off, and then Rosie and the girls went off in victory while Adam, confused that his secretive talk about straight brows had somehow gotten out, had a drink with the other boys. But, I should note, this wasn't enough to stop Adam and Rosie sleeping in the same bed that evening. 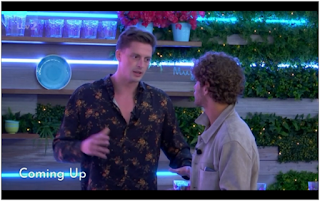 For the next evening, however, a re-coupling was announced - which sounds like something you'd do to your car, but is where the couples change - and the girls would get to choose who they would couple up with. This was an excellent to see as it made all of the guys extremely nervous and awkward. Despite the events of the night before, Rosie was still wondering if she should give Adam a second chance. Her girlfriends reassured her "he mugged you off, but you mugged him off harder" - not sure if 'mugged off' is a euphemism for something, I'm not familiar with it if it is. Rosie decided to wind up Adam by chatting to Charlie, who commented that he liked the bit of theatre the night before, he was going to get the popcorn out. Not sure what theatre you get popcorn at, but it sounds like a good one. 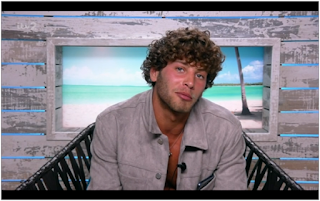 Meanwhile, Megan the brows was trying to decide who to re-couple with, either Alex the doctor - who no one fancies - or "Eyal", a curly haired rapscallion that everyone is convinced will certainly aim to get with Megan but isn't expected to be a good long-term choice. I didn't immediately imagine that people would go onto Love Island looking for a marriage-partner but perhaps I'm wrong. No idea why none of the girls like Dr Alex and his amazing shirt. On the evening of the grand re-coupling, Adam got nervous about Rosie talking to Charlie, going as far as to wear a bandana. There ain't no alpha male like an alpha male with a bandana. Meanwhile, after Dr Alex had spent 2 days trailing after Megan the eyebrow girl, generally being really nice, attentive, thoughtful, AND HE'S A DOCTOR, Eyal the curly sat down next to her for 2 minutes, and kissed her in front of Dr Alex. "This villa can throw anything at you" says Eyal. Like watching your crush be kissed by a curly haired man, I guess. Dr Alex wasn't best pleased about this. Sadly, the show ended at this point so I have no idea which of the boys the girls choose, but I'm sure all will be revealed in tomorrow's show. I have to say, it's certainly not something that I would normally choose to watch, but it was reasonably enjoyable (certainly compared to Made in Chelsea, which is possibly the most bizarrely addictive bad TV I've ever seen), and at least now I've got a vague idea of the people that keep trending on Twitter around 9pm-10pm in the UK.